Two women roasting on a spit by those in error. This Saint lived during the reign of Decius (249-251). It is said concerning him that he was monstrous and strange, namely that he was dog-faced, and that he came from a land of people that were cannibals. ** Captured in battle by a comes, he was unable to speak, so he prayed and an Angel of the Lord was sent to him saying: "Be manly, Reprobus" (for this was his previous name). Then the Angel took hold of his lips, and made him speak freely. The Saint then went into the city, and rebuked the Greek pagans who were persecuting the Christians. For this he was beaten by a governor named Bacchus, to whom the Saint replied: "Willingly I humbled myself to the commandments of Christ, and I stood in place and was captured. For if I wanted to be moved by my rage and bravery, I will shrink neither from you, nor from the strength of the emperor, which compared with my strength is weak and nothing." Therefore the emperor feared him, and his strength, and his ugly face, so he sent two hundred soldiers to arrest him, while he himself held no weapons in his hands, except a staff of wood which he held. Because the bread of the soldiers had diminished along the way, and they had nothing else to eat, the Saint prayed, and the few loaves remaining multiplied. This paradoxical miracle astonished the soldiers, and they believed in Christ. When they arrived in Antioch, the Hieromartyr Babylas, who was Bishop of Antioch, baptized the soldiers along with the Saint, and from Reprobus his name was changed to Christopher. When the Saint stood before the imperial court, the emperor saw him and was astonished, and out of fear he fell backwards. Having come to himself, he considered how to change the Saint through trickery, and soften his will with flatteries, so that by these he would be able to separate him from his faith in Christ, for he did not dare try and persuade him with threats. So what did he do? He invited two women, whose names were Kalliniki and Akylina, who were beautiful to the eyes, but harlots and unbridled in their will, and they were very suitable in warming up and persuading men towards the desires of the flesh. These were ordered to go to the Saint and change him by any means possible by attracting him to love them. In this way the defiled one hoped to separate the Martyr from Christ, and have him offer a sacrifice to the idols. But the opposite of what emperor hoped for happened. For the Saint catechized the above-mentioned harlots, and he separated them from the pagan religion. Thus they stood before the emperor, and confessed that they were Christians. The emperor therefore had them punished and tortured, having them impaled with a spit from their feet to their shoulders. Having bravely endured this terrible torture, the blessed ones received crowns of martyrdom. 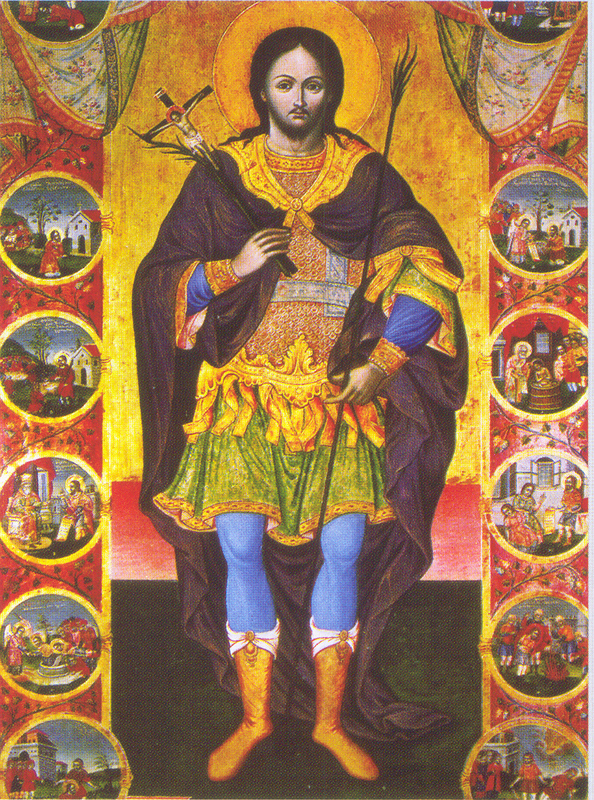 This inflamed the emperor with rage, so he reviled Saint Christopher for his ugly and monstrous face. The Saint responded to him that he was fit to receive the energies of the devil, by this referring to his name Decius. Immediately the inhuman tyrant decided to kill the above-mentioned two hundred soldiers, who had been sent to arrest the Saint, but in return came to believe in Christ, and the blessed ones received crowns of martyrdom. 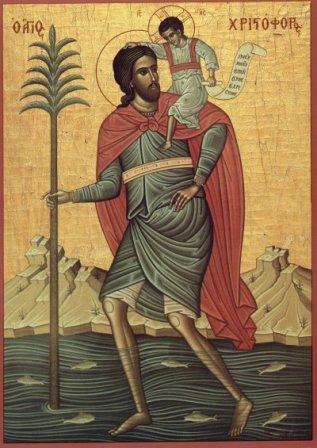 It was ordered for Saint Christopher to be nailed on a bronze mechanical instrument, underneath which was a lit flame. The Saint was not only preserved unharmed from this torment, but he seemed to be relaxed and resting. These strange things were reported by many unbelievers, to whom they seemed unbelievable and impossible, while to the faithful and discerning it was very believable and easily received. The blessed one would say, that he saw a tall and large-bodied man, fair in countenance, who wore white garments, and with the lightning bolts flashing from his countenance, he covered the brilliance of the sun. On his head was a bright crown, and around him were soldiers with a fiery form, against whom fought others who were black and ugly, and they appeared to be victorious. But when that awesome ruler turned with anger, he frightened and trampled all those who battled against him, and he received from them authority and power. * The first mentioned Christopher in these verses refers to Christopher of Mytilene, an 11th century poet and patrician from Constantinople. Most of the iambic verses in the Synaxarion of Constantinople, such as this one dedicated to Saint Christopher, were composed by him. 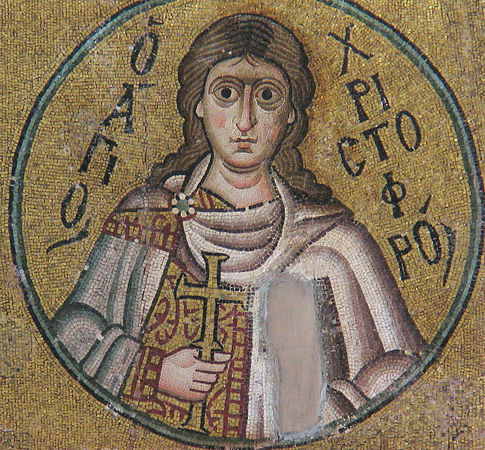 ** According to St. Nikodemos the Hagiorite: "Dog-faced means here that the Saint was ugly and disfigured in his face, and not that he completely had the form of a dog, as many uneducated painters depict him. His face was human, like all other humans, but it was ugly and monstrous and wild. God created one form and one nature for all humans, and if some slightly alter from others, they are not altogether dissimilar. That there are many nations which were and are cannibals, is testified by ancient historians. Even now those called Kalmyks who are in the kingdom of Russia, these are cannibals." 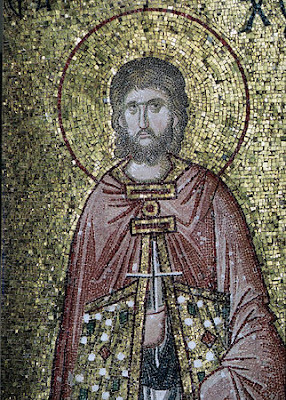 *** The head of St. Christopher is kept at the Athonite Monastery of Karakalou. Portions of his relics are in the Monasteries of Prousos in Euratania, Nativity of the Theotokos in Aegina, Holy Unmercenaries in Kastoria, and Kykkos in Cyprus.